Card of Sergeant Alexander Beaumont With many thanks to John Sheen, from his personal collection. Served with the 18th (Durham Pals) & 20th (Wearside) Battalions DLI. 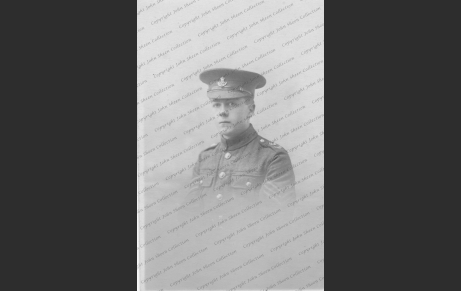 Alexander Beaumont enlisted with 18th Durham Light Infantry (DLI) in September 1914, being numbered 18/685. He entered Egypt with this battalion on 22 December 1915 and was subsequently posted to 20th DLI. After returning from the Italian front, he was posted to 1/9th DLI and then transferred to Class Z Reserve on 17 February 1919. He was finally discharged on 19 March 1919. The photograph shown here is marked on the back: “A Beaumont B Coy 20th Batt 41st Div”. Do you know anything further about Alexander Beaumont? Please do let us know so that we can expand his story.